If Gratuitous Space Battles was the pummeling thrash of Slayer, and GalCiv III the glacial drone of Black Sabbath’s War Pigs, then Starfall is Sandman-era Metallica: still chugging along in tense real-time, but slow enough that its multiplayer fleet management can be enjoyed by tabletop wargamers. When asked to expand on the metal concert thing, Grigoryev said that his team were in the business of building “fulfilling fantasy”. Snowforged Entertainment, so named for their location in the hills of Siberia, believe that classical RTS, 4X and wargames tend to specialise too heavily. In each case, some key aspect is overlooked: an expansive universe; complex management; half-decent combat. 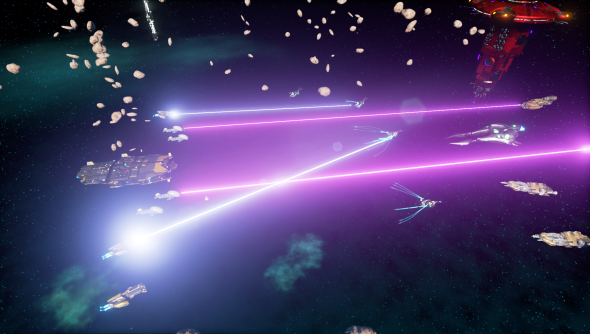 In Starfall Tactics, they hope to tie tactical, fleet-scale fights to a decaying galaxy big enough to get lost in. Their war-torn vacuum will be dotted with rare ship modules which, when found, will feed back into the battles. 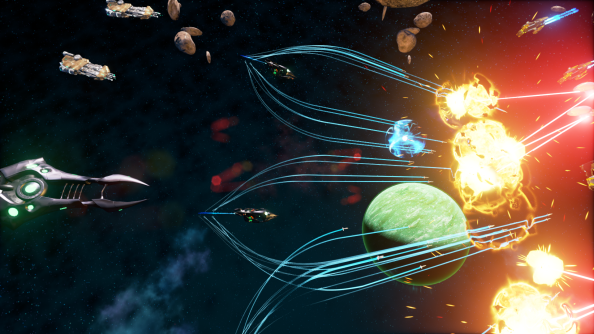 Snowforged want to encourage experimentation: the player inventive enough to equip a couple of low-cost ships with the Cloak System and Self-Destruction modules, for instance, will be rewarded with a pair of invisible kamikaze bombers. 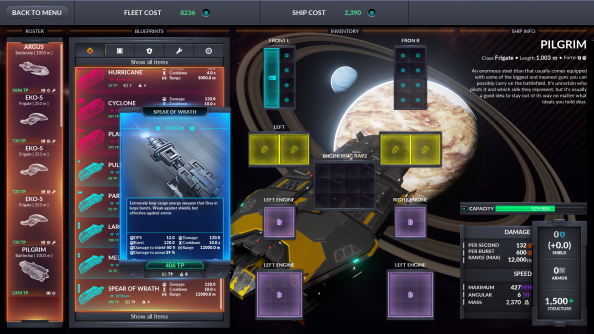 Loadout customisation deepens with ship blueprints, displayed neatly as cards. With the application of the right parts, the same ship can be scout, heavy cruiser or assault carrier. Every part of a vessel can be swapped out, from its engines up to its paintjob. The cards and paintwork are also a sign of Snowforged’s fondness for distinctly un-digital games. Kickstarter footage of their office takes in Warhammer miniatures propped proudly on their desks. As with any digital adaptation, there’s the allure of convenience. Snowforged want to play tabletop games without the hassle of organising a session – an appropriate location, a table to seat enough people, a schedule that works for everyone – and suspect others do too. If Starfall’s Kickstarter fails, Snowforged will release a multiplayer, session-based game. But if it succeeds, they’ll bring players together in their thousands on a persistent galactic meta-map. The player’s fleet, represented by a single starship, will drift about stealing territory from pirates, mercenaries and battling factions. A wargamer’s paradise. So why is the blast-icuffs in real-time? The team were concerned about pacing; about keeping players engaged at all times. Rather than risk that, Snowforged are designing a combat system that sees events unfold in the vacuum in real-time. But it’ll be unhurried enough to allow players to adapt strategies on the fly, and to maintain tension. Snowforged have spent quite a bit of time adjusting movement and action speeds to prevent information overload during heated battles. It’s an ongoing balancing act: the studio have hosted several playtests at their office, and are planning plenty more before launch. The game’s found a home in Unreal Engine 4 – because the team consider it the “most technologically advanced” engine on the market, and because it’s allowed them to write the game’s innards in C++ while programming high-level tasks in Blueprint – Unreal’s visual scripting system. Starfall’s community is expanding too; it was Greenlit after just nine days on Steam this month. But hark at the handful of Kickstarter backers who’ve pushed Snowforged nearly halfway to their goal at the time of writing: just 295 of them contributing over $21,000. This steadily-paced strategy game may take its time in landing a hit – but its capacity for self-expression means that when it does connect with a potential player, it turns out to be a very big hit indeed. 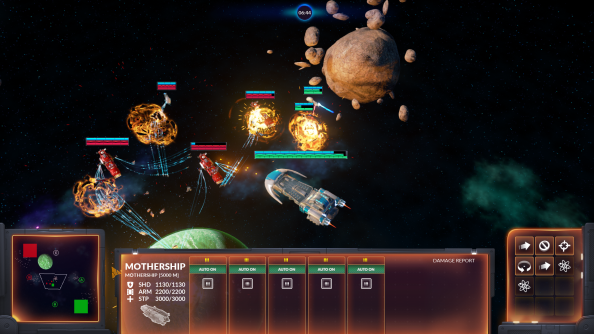 Starfall Tactics is coming to PC this year. Unreal Engine 4 development is now free. In this sponsored series, we’re looking at how game developers are taking advantage of Unreal Engine 4 to create a new generation of PC games. With thanks to Epic Games and Snowforged Entertainment.